The NordicTrack Commercial 2450 treadmill has plenty of the extras users want for in-home use in a machine with a surprisingly low price tag considering the commercial-quality features and capabilities. It's a step up from the very popular 1750, with a stronger motor and more built in workouts, among other enhanced touches. With 40 workout apps and a 10" web-enabled touch screen for tracking your workouts, you're getting plenty of bang for your buck. The treadmill itself is well designed and well constructed, with a large running area and advanced cushioning to reduce impact. 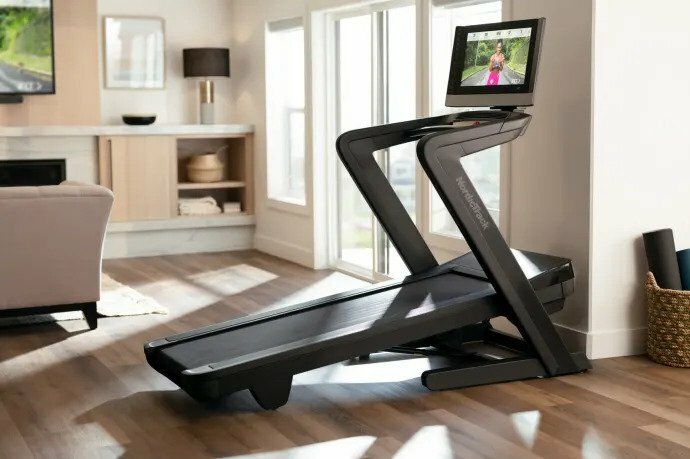 Footprint: 72.25" x 34" x 61"
Most reviews for the NordicTrack Commercial 2450 treadmill praise the upgrades from the previous model, which include the new 10" web-enabled Smart HD touch screen, new WhisperQuiet design and the adjustable tablet holder. 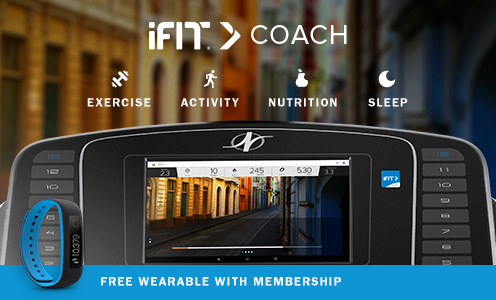 You also get a very powerful 4.0 CHP motor (a little stronger than the 3.6 CHP motor on the 1750 model), 40 built-in workouts on top of the ones you get through iFit Coach Plus, which also gives you tracking and sharing capabilities as well as Google maps to choose any destination world-wide to run in virtually. The 2450 also gives you incline as well as decline, which is great for targeting different muscle groups. You don't find decline on many treadmills, especially in this price range, so it's a great added touch. You can adjust the cushioning to fit your needs, either softening it to reduce impact on your knees and joints, or setting it to replicate the feel of running outside on the road. Other great features include the generously sized runner's belt, Bluetooth heart rate monitoring for more accuracy (free chest strap included), iPod compatible sound system for your music and SpaceSaver design which makes it easy to fold and store. The 2450 is very similar to the top of the line 2950 model, except the latter has a 4.25 CHP motor and a large 22" Smart HD touch screen. How Does the Commercial 2450 Compare to the Other NordicTrack Treadmills? There are currently three different NordicTrack treadmill series on the market today: the entry level T Series, the Commercial Series and the Incline Trainer Series. There are also two desk treadmills, but those are a bit different. The T Series is the most most affordable of all of them, starting at about $899 for the base model and moving up to $1799 for the most advanced ones. You get a nice array of workout programs, iFit, incline levels and hand grip heart rate monitoring. Moving up you have the Commercial Series, consisting of the base Commercial 1750, the mid-range Commercial 2450 and the top of the line Commercial 2950. They range in price from $1599 to $2699. These treadmills have more powerful motors, stronger build, better cushioning and more incline as well as decline capability, and include even more built in workout programs and higher max weight capacities than the T Series models. The 1750, one of our top picks and perhaps the most popular of all of the NordicTrack treadmills, gives you a strong 3.6 CHP motor, a 7" Smart HD touch screen, up to 12 mph speed, up to 15% incline and -3% decline, grip and wireless heart rate monitoring, a 22" x 60" well cushioned deck and 38 built in workouts. The step-up model, as you read about above, gives you a more powerful 4.0 CHP motor, more advanced Runner's Flex cushioning, similar 10" Smart HD touch screen and 40 built in workouts in addition to all of the other features found on the Commercial 1750. The top model in the series gives you all of the features of the Commercial 2450 plus a 22" Smart HD display (also found on the Incline Trainer X22i) and the strongest motor in the series: 4.25 CHP. All of the Commercial treadmills come with a free wireless chest strap, iFit Coach technology, adjustable tablet holders, music ports, AutoBreeze workout fans, SpaceSaver folding design and a solid lifetime frame and motor warranty. So as you can see the NordicTrack Commercial 2450 gives you a bit more than the already feature-packed 1750, with more power, larger touch screen and a few more workouts. You can think of the Incline Trainers as Commercial treadmills with more incline and more decline. They are built specifically for those who want even steeper angles for more intense cardio training, calorie burning and leg muscle targeting. The X11i, X15i, X22i and X32i incline up to 40% and decline up to -6%, as opposed to 15% and -3% on the Commercial 2450 and others. So that's the main difference between those two series...the Incline Trainers are also the most expensive of all of the NordicTrack treadmills. So which NordicTrack treadmill should you choose? You really can't go wrong with any of the NordicTrack Commercial Series treadmills, and they have all been on Best Treadmill lists in various categories for years. That said, the Commercial 1750 has absolutely everything you need, so it is our favorite choice of the three, as well as the least expensive. However, the stronger motor and adjustable cushioning on the Commercial 2450 might appeal to you if you can swing the extra $400. The Commercial 2950 with its 22" Smart HD touch screen is awesome, but you don't necessarily need it. Plus it's another $700 on top of the price of the NordicTrack Commercial 2450. NordicTrack took the feedback of serious athletes and improved the power of the motor in this commercial grade treadmill. They also did away with the old QuadFlex™ deck cushioning and added their Runners Flex™ cushioning system, which can be switched off to give a more realistic road feel for those who want to more closely mimic an outdoor feel. When engaged, it minimizes jarring of the joints so that anyone can use it regardless of their fitness level. With the improved core features the NordicTrack Commercial 2450 treadmill may just be the machine that can be everything to everybody. While listed at $2,799, you can usually get it for $2,100 or even $1,999, which makes it one of the best treadmills available in that price range. At this price point, it's worth every penny, particularly with the improved warranty on parts and labor. If you want to save a little bit of money, look at the base Commercial 1750 as well, which gives you almost everything the 2450 has. And if you like the idea of a huge 22" Smart HD touch screen, take a look at the top of the line Commercial 2950 treadmill. Get the popular Commercial 2450 on sale right now!